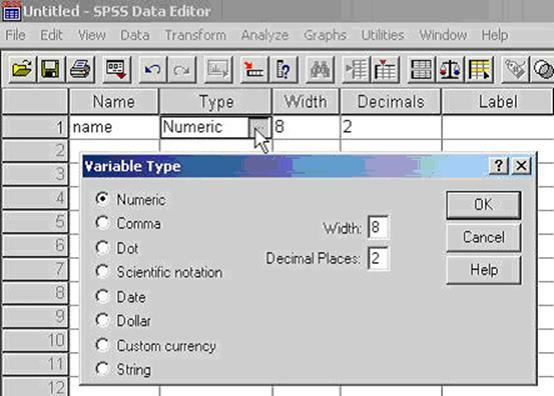 Creating A Data File in the SPSS editor. Notice that the "Characters" selection box now has the value of 8 in it (the default). This should usually be set to 25 or 30 depending how long the names of your subjects might be. 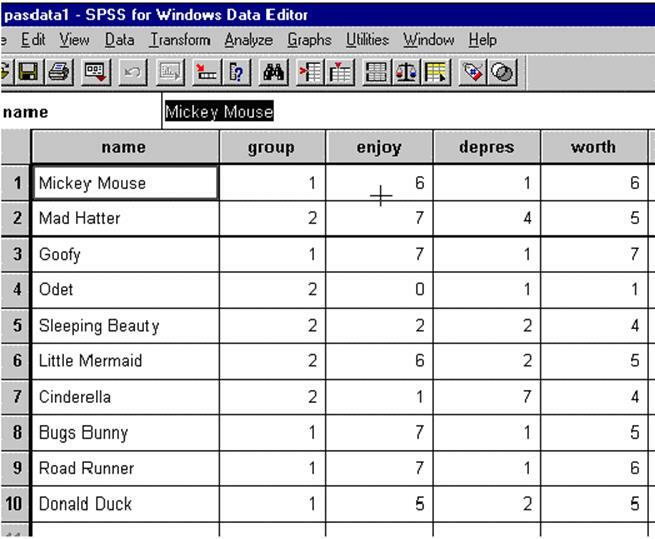 The longest name in our data set above is Sleeping Beauty with 14 characters. We will set our length to 25 in the following manner. Click in the "Characters" box and type 25 as shown below. Click OK and the Variable View window appears again with the first variable "Name" completed as shown. 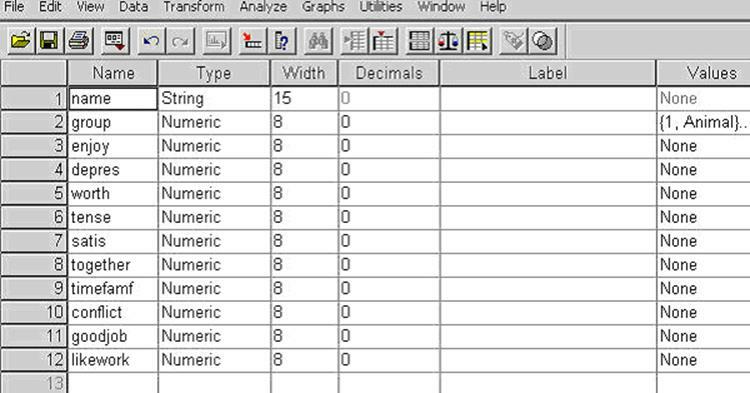 Defining each of the remaining variables (numeric) will follow the same format. Once all of the variables are defined you may enter the data. 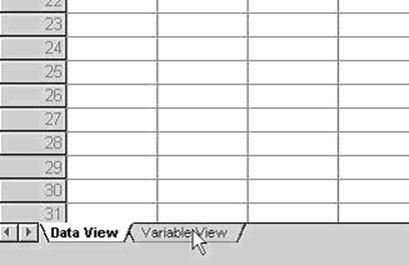 In the lower left hand corner click on Data View and the following screen will appear. Notice that the column headings have changed. These headings are characteristics of variables that you may now use to define your variables. Type "name" in the name column-it will identify the first column in your data base as the place to enter the name of the person from the data. The computer then fills in the remainder of that row with "default" information. Notice is the graphic below that it filled in the second column with "numeric". 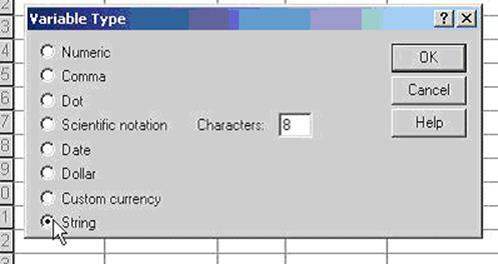 However, in this case we do not want the variable "name" to be numeric since names usually have characters rather than numbers. 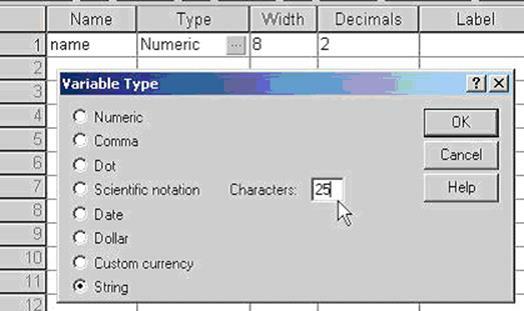 Consequently, you should click on numeric and the "Variable Type" box will open as shown in the graphic.